HWASEONG, South Korea — When beginning work on the next-generation Sonata sedan, Hyundai engineers asked whether they should even bother, given the segment's slumping sales. But the automaker decided the 34-year-old nameplate had too much brand equity to lose. So, instead of killing off its midsize workhorse like some rivals, Hyundai opted to make a splash with its update. "In the beginning, we were like, 'Is it right to carry on with this?' We had questions," Hyundai's global design head, SangYup Lee, said. "But this car is the one that made the brand. If we can make a statement with this car, it means something for the company and for this segment." Indeed, Hyundai promises that the redesigned, eighth-generation Sonata for 2020, unveiled March 27, is packed with "Four News," which will make the stalwart sedan stand out from the crowd. On tap: a new platform, a new powertrain, a new design language and new technologies. One of Hyundai's oldest nameplates is now leading off a wave of products that will leverage similar offerings as Hyundai looks to burnish its reputation as a leader in stylish design and cool technology, all wrapped in a tough-to-beat value-for-money proposition. Last year, U.S. sales of the Sonata slumped 20 percent to 105,118 units and the nameplate ranked sixth in the segment behind the Toyota Camry, Honda Accord, Nissan Altima, Ford Fusion and Chevrolet Malibu. The midsize car segment shrank 16 percent. But competition in the segment may soon thin out. Ford announced last year that it will discontinue the Fusion, along with the Fiesta, C-Max, Focus and Taurus as it bails on the sedan segment. General Motors, meanwhile, plans to dump the Chevrolet Impala, along with the Chevrolet Cruze, Buick LaCrosse and Cadillac CT6. "There are two key reasons why people today should still buy a sedan. It's either very sporty or it has good fuel economy," Albert Biermann, Hyundai's newly promoted president of r&d, said at a recent test drive here at the automaker's Namyang technical center. "And the Sonata has both." 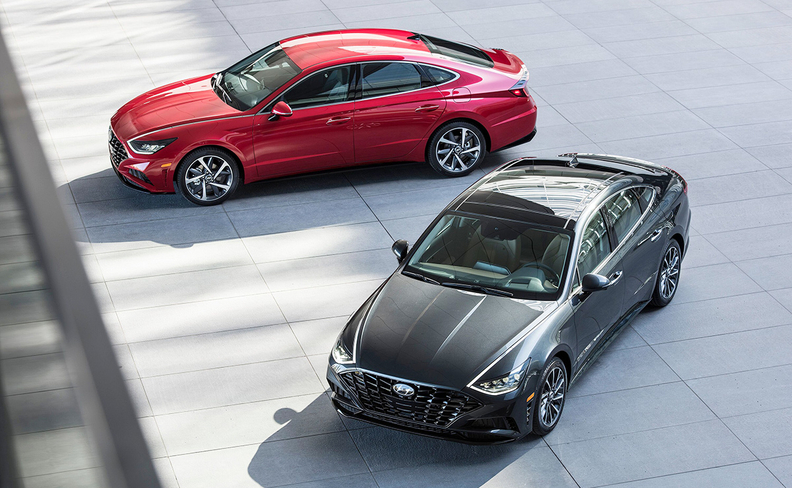 For starters, the Sonata will be the first Hyundai nameplate to ride on a new third-generation vehicle platform designed to improve handling, safety, power and fuel efficiency. Extensive use of super-high-tensile steel reduces weight while keeping the body rigid and responsive. The updated Sonata is also longer, wider and lower than its predecessor. Hyundai isn't saying what other nameplates will use the new N3 platform. But the outgoing Sonata shares its architecture with many vehicles, such as the Grandeur sedan and Santa Fe and Tucson crossovers, as well as the Kia Cadenza sedan and Kia Sportage and Sorento crossovers. Under the hood, it offers two of Hyundai's new Smartstream gasoline powertrains. A 1.6-liter turbo generates 180 hp and 195 pound-feet of torque, while the 2.5-liter direct-injection power plant cranks out 191 hp and 181 pound-feet. Both engines are mated to an eight-speed automatic transmission and achieve better fuel economy than the outgoing setup. The turbo alone delivers a 3 percent improvement in fuel consumption, Hyundai said. Hyundai is also making standard hybrid and plug-in hybrid variants as well, Biermann said. Also in the works is a performance edition, either an N Line variant or a top tier, pure N version. "Something from N will come," Biermann said. Design is where the new Sonata really shines. It employs the new "Sensuous Sportiness" design language Hyundai foreshadowed in the Le Fil Rouge four-door coupe concept at last year's Geneva auto show. The sloped roofline and short front overhang lend performance proportions in contrast to today's more staid, stolid Sonata. The car keeps its front-wheel-drive layout but gets a stance approaching that of a rear-wheel drive thanks partly to the new platform. It allows the engine to be moved rearward by several centimeters, helping reduce the clunky front overhang common in front-wheel offerings. Designers were able to strip down front-fender bulk and achieve rounded front corners that cleave close to the tires. That is thanks to early interaction with the engineering team through a new digitalized design-engineering process that brings both sides together from the start. "We started from the architecture and the engineering from the very beginning," Lee said. A key element of the new look is the use of so-called Hidden Lighting Lamps for the daytime running lights, which wrap around the headlamps in an arrow shape. In the daytime, they look like normal chrome stripping, part of a styling flourish that reaches up the sides of the hood and connects with the stripping around the cabin doors. But at night, lights from under the strip illuminate in a striking gradient. Hyundai calls this "light architecture" and says it will be a defining feature of future design. "This is only the beginning," Lee said. The upcoming Sonata is also packed with new technology features. Chief among them is a new digital key that allows customers to use their smartphones to unlock and start their cars. It also gets a super-bright head-up display with an 8-inch projected image. Another feature is Walk Away Lock, which locks the car for the driver, even when he or she forgets. To make driving safer, the Sonata gets an upgraded suite of driver-assist systems that elevate the car to Level 2 autonomy, under Society of American Engineers criteria. Its three radars, 12 ultrasonic sensors and five cameras allow the car to steer and brake itself in limited scenarios. Also included in the package: forward collision-avoidance assist, blind-spot view monitor, lane-follow assist, reverse parking collision-avoidance assist and safety exit assist, a function that uses radar to warn passengers opening a door when a vehicle is approaching from behind. There is also a nifty, first-in-class remote smart parking assist feature. It helps drivers maneuver the car into parking spots too narrow to open the doors. The idea is: Unload passengers and cargo first, then use a smart key to thread the car into or out of the tight fit.